Panel 1: Comorbidity: when a person has two or more disorders at the same time or one after the other. This occurs frequently with substance use and mental disorders. Comorbidity also means that interactions between these two disorders can worsen the course of both. Panel 2: Who is affected? 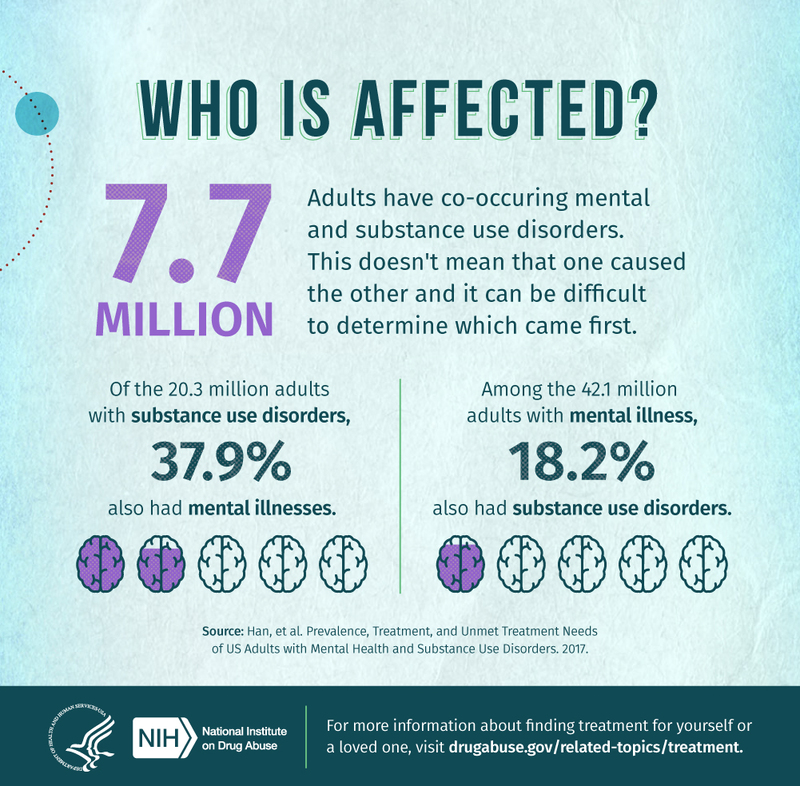 7.7 million adults have co-occurring mental and substance use disorders. This doesn’t mean that one caused the other and it can be difficult to determine which came first. Of the 20.3 million adults with substance use disorders, 37.9% also had mental illnesses. Among the 42.1 million adults with mental illness, 18.2% also had substance use disorders. Panel 3: Who gets treatment? 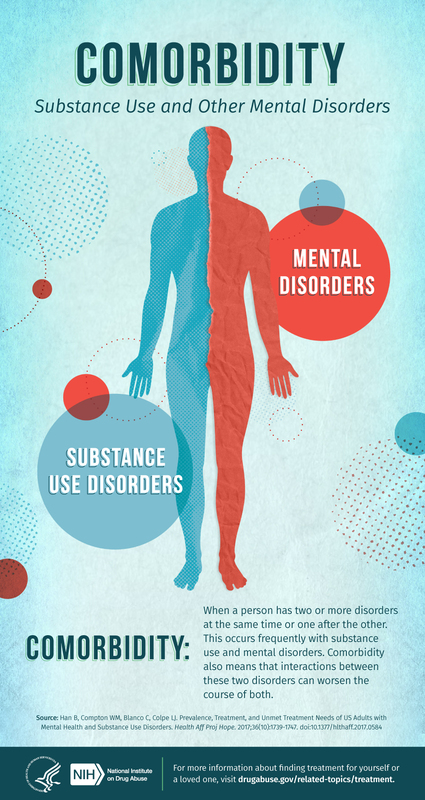 There are many effective treatments for both mental and substance use disorders. A comprehensive treatment approach will address both disorders at the same time. 52.5% of those with co-occurring conditions received neither mental health care not substance use treatment. 34.5% of those with co-occurring conditions received mental health care only. 09.1% of those with co-occurring conditions received both mental health care and substance use treatment. 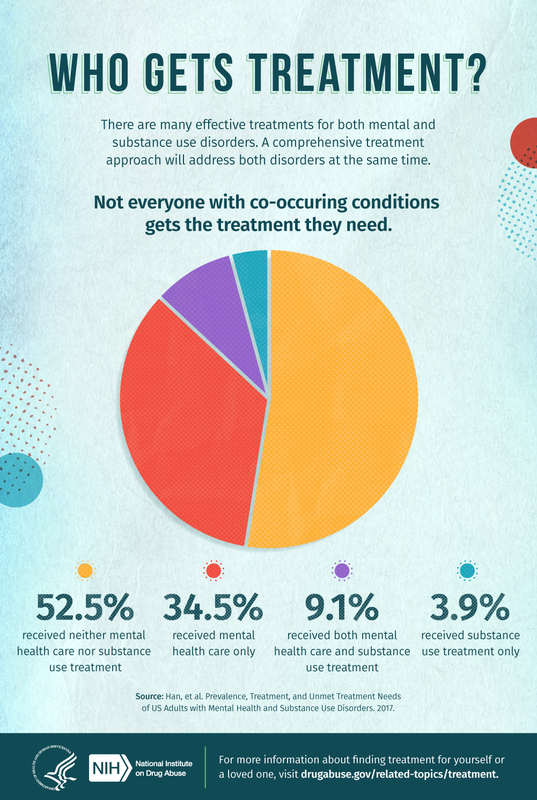 3.9% of those with co-occurring conditions received substance use treatment only. Panel 4: What are the barriers to getting treatment? Even among people who want to find help, barriers exist to receiving it. 52.2% said they could not afford the cost. 23.8% said they did not know where to go for treatment. 23.0% said they could handle the problem without treatment. 13.6% said they feared being committed. 12.4% said it might cause their neighbors to have a negative opinion of them. 11.1% said they did not think treatment would help. 10.6% said they did not have the time. 10.1% said they were concerned about confidentiality. 38.4% said they were not ready to stop using. 35.1% said they had no health insurance and could not afford the cost. 13.1% said it might cause their neighbors to have a negative opinion of them. 13.0% said it might have a negative effect on their job. 11.5% said they did not know where to go for treatment. 9.9% said they had insurance, but it did not cover the treatment cost. 9.0% said no program had the treatment type. Percentages represent the annual average weighted percentage. Please note, respondents could provide more than one response. For more information about finding treatment or yourself or a loved one, visit, drugabuse.gov/related-topics/treatment.